So, there it is. The big debate over whether the Phillies would keep Ryan Howard or Jayson Werth has been answered with a resounding “HOWARD.” At least, for now. The big first baseman has inked a five-year extension worth about $125 million, with an option for a sixth year and a limited no-trade clause. Howard will become the only player not named Alex Rodriguez to make at least $25 million a season when the new deal kicks in for the 2012 season, at least for now. With his current deal running through next season, the timing of this announcement comes as bit of a surprise. That notwithstanding, the new big debate immediately revolves around Howard’s worth. Is this contract an accurate projection of what Howard will accomplish from the 2012 to 2016 seasons? Remember, contracts are for production you expect, not production you’ve received. Will Ryan Howard, from age 32 to 36, be a player even more valuable than he was from 2006 to 2009? Will he be as valuable as other players being paid that much, a la Rodriguez and (presumably) Albert Pujols and Prince Fielder? The fact is that no one knows the answer to that question, for sure. Not yet. All a person like me can do is look at the numbers and the history and make a determination for my own sake, and that determination is simple: Ryan Howard is not now and will not be worth his new contract extension. In what will be a point/counterpoint argument, I’ll be playing the bad cop to Corey’s good cop. I’m about to tell you why this is a bad deal for the Phillies. He’ll rebuild your spirits in a post of defense to follow. There’s even some thematic music at the bottom to tap your toes to as you read. Ryan Howard is an exciting player. I enjoy having him play for my team, and I can certainly appreciate the raw power he brings to the dish in every plate appearance. I can certainly understand why he often gets more appreciation than Chase Utley; most fans see batting average, home runs and RBI as the biggest measures of success, and thus see little to sway them away from favoring Howard as the better player. That’s fine. Utley is better for reasons that are irrelevant to the true point of this article, but the line of thinking seemingly at play here establishes some sort of rationale for this deal, and the likely acceptance most fans will meet it with. The breakdown is as follows: starting with the 2012 season, Howard will make $20 million from ’12-’13, then $25 million from ’14-’16 with a $23 million club option for 2017, plus a limited no-trade clause. Howard will play his age 32-37 seasons under this new deal, a time that will make paying him such amounts of money quite dubious. Through 2009, Howard’s age 29 season, his five most comparable hitters are Richie Sexson, Cecil Fielder, Mo Vaughn, Willie McCovey and David Ortiz, according to Baseball-Reference.com. Determined through comparison of past performance, these are the players B-R has pegged as most similar to Howard. All of those signify marked declines from the prime years of each of those hitters. The scariest part of those numbers isn’t even necessarily the relatively pedestrian offensive lines, it’s the stark lack of longevity. All four had body types too big to play effective defense, and all were exclusively first basemen or designated hitters. Howard’s body type isn’t far removed, as his 6’4″, 225-pound frame puts him right smack-dab in the middle of the bodies those four sported. Prodigious power hitters with average contact skills and decent plate discipline, all mired in “slumps” to end their careers; ending them abruptly, at that. Those guys are not Ryan Howard to a T, no, but they are very similar. Will Howard have a career arc that trails off as quickly as those listed above? Maybe, maybe not. For every McCovey-type, though, it seems there are four Sexons, Vaughns, Fielders and Ortizes*. *The remaining five comparable players to Howard that B-R lists – Tony Clark, Mark McGwire, Carlos Delgado, Fred McGriff and Norm Cash – combined to put up a much more reassuring .275/.370 line, with many of them accumulating significant playing time into their later 30s. I’m hopeful Howard will follow their career paths more closely, but can’t help thinking they were in the bottom five of comparables for a reason. Steering away from the careers of others and back to Howard, let’s place his production in line with his new $25 million compatriot, Alex Rodriguez. Do the numbers stack up? Is Howard comparable to Rodriguez? Equating salaries is not my forte, and I won’t try to discuss something I am not fluent in. Knowing that, take a look at A-Rod’s latest contract, signed following the 2007 season when Rodriguez was 31. A 10-year deal worth $275 million made A-Rod the richest player ever. He’ll make $25 million per season or more through 2014, with salaries of $21 million, $20 million and $20 million thereafter. He will be 42 when his contract ends. Howard’s deal is not quite as severe, but Howard is also not the player A-Rod is, nor are the Phillies the Yankees. General Manager Ruben Amaro does seem to think Howard will be worth about as much to the Phillies as the Yankees hope Rodriguez will be. In opening that door, comparisons have at least been made fair game. Check out the two graphs above. 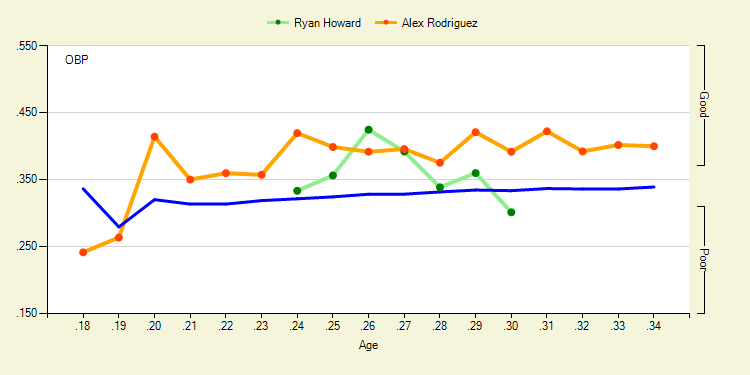 Thanks to Fangraphs’ nice comparison tool, the career paths of Howard and Rodriguez have been synced up rather nicely. You can even ignore the last drop in Howard’s line, as that includes the current, far from complete season. The first dot also includes a very partial, pre-rookie season. The middle five are where the money is. The top graph shows on-base percentage, or the number of times each didn’t make an out. Howard’s MVP campaign in 2006 gives him his lone victory over A-Rod, here. Beyond that, he’s noticeably below A-Rod and only just about his equal at one point. 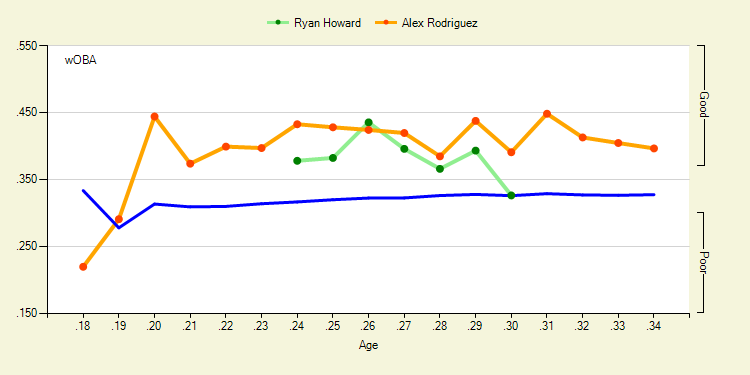 Really, 2005, 2008 and 2009 found Howard only barely above league average (denoted by the solid blue line). The second graph denotes Weighted On-Base Average, or wOBA*. You can read up on wOBA here, but for the sake of simplicity, regard this as an advanced form of the above stat, OBP, that also includes slugging, so Howard’s power is not discounted. *As I’m sure most of you are familiar with OPS, take note of how this differs. Weighted on-base is a way of properly valuing both on-base and slugging percentage. Simply squishing them together into OPS makes things a little sloppy; OBP’s maximum is 1.000, while slugging tops out at 4.000 (if you homered every time you came to the plate), yet both are treated equally when combined into OPS. Weighted on-base tries to right the playing field a bit, and present its result on the OBP scale. So there’s a quick briefing on that. The graphs are nearly the same. Howard’s power does not eclipse Rodriguez, nor does it provide enough leverage to significantly close the gaps in traditional OBP. In fact, Howard’s MVP season in ’06 is actually made less impressive, as Rodriguez had a year that was nearly equal over those multiple facets. It still remains to be seen whether Howard can maintain his production at a level near A-Rod in the coming years. So, considering the above, as well as Rodriguez’s superior contact, plate discipline and comparable power, it’s safe to assume that Alex Rodriguez is a better player without much serious competition. It follows that the line of thinking that compares Howard to Rodriguez in order to structure a new contract is patently misguided. Even if you think baseball’s salary per win goes up to $4.25 million this coming offseason and rises at a 5% clip every winter through 2017, Howard will need to produce an average of 4.75 wins from 2012 through 2017 just in order to justify his salary. If you factor in that Howard gets (even more) long-term security from this deal, then that average production levels goes up to 5.3 wins. The “wins” Mr. Carruth is referencing are Wins Above Replacement, a stat Michael and I introduced some of you to in our Total WAR series. Wins Above Replacement is a stat that seeks to encapsulate all of a player’s abilities into one simple-to-use – if not so simple-to-calculate – statistic: how many “wins” do a player’s offense and defense contribute to his team over any given “replacement” player, who could be any Joe Smith called up from the minor leagues tomorrow. He says that Howard needs to average about five wins over the life of his new deal in order to justify it, in terms of justifying salary with production. Unfortunately, Howard has bested five wins just once: 2006. He hit 4.9 last year, but managed just 4.2 and 3.3 wins in ’06 and ’07. In fact, Howard has averaged below five wins over his four complete seasons, the prime seasons of his career. If he can’t manage an average of five wins above replacement in what should be the best years of his career, what makes anyone think his post-prime years (and beyond) will be better? Not just that, how can they be consistently better over a longer period? Of course, it would be another thing entirely if Howard played a premium defensive position, like catcher, shortstop, second base or center field. There is an added emphasis on defensive proficiency at each of those position, and so players who can play them well defensively and contribute offensively are valued higher. Logical, yes? Howard plays first base, one of the least-taxing defensive positions on the field. He plays first base among a field of players that includes Albert Pujols, Prince Fielder, Mark Teixeira, Adrian Gonzalez, Miguel Cabrera, Adam Dunn, Joey Votto, Lance Berkman, Derrek Lee and others, like Kendry Morales. Howard’s numbers are impressive, but just how impressive are they, relative to his field? Well, WAR already took some of that into account – hence numbers that were probably a bit lower than you expected – but they don’t detail Howard’s ranks among his first base peers. In 2009, among first basemen with at least 300 plate appearances, Howard was 14th in batting average, 16th in on-base percentage, and fourth in slugging. In 2008, Howard was 29th in average, 25th in OBP and seventh in slugging. Again, that’s exclusively among first basemen, and 2007’s ranks aren’t much better (though they are an improvement over ’08). With this extension, Phillies brass are paying Ryan Howard to be not only one of the best first basemen in the game, but one of the five best players period, and they expect him to stay at that level for many, many years to come. As it stands right now, Howard isn’t even one of the five best first basemen in the league, much less one of the best regardless of position*. *Because I’m sure you were just dying to know, Howard’s ranks in WAR among M.L. first basemen from 2007 to 2009 are fifth, ninth and eighth, respectively. Very good, but worth this much coin? For three years, it looked as though Howard was already set to decline. At least, it seemed that way, given his declining walk rate (found here under BB%) and increasing tendency to swing at balls out of the strike zone (denoted here by O-Swing%). It seemed as though 2009 bucked that trend. His slash stats went up across the board, his BABIP went up 40 points despite no discernible increase in line drive percent with way more fly balls than ground balls, and his strikeout rate went down (though it was still 30 percent). Had this extension happened months later, the current project on Howard and the shift would be done and we’d have a conclusive reason why this happened. Alas. Back on track, Howard’s even a one-tool player in relation to pitcher handedness, too. For his career, Ryan is a .226/.309/.443 career hitter against lefty pitchers, while he mashes righties to the tune of .307/.406/.656, a huge disparity. Years into his Major League career, he still has extreme difficulties against left-handed pitching, and there’s little reason to think that will improve after he’s already spent so much time with the big league club. From .225 to .224 to .207 batting against lefties from 2007 to 2009, the downward trend is scary. If he’s not already, it seems Ryan Howard’s skill set is destined to turn him into a platoon player. A platoon player who is very, very good at his specialty, but pretty much one-dimensional just the same. It seems to me, then, that this deal is a result of an old-fashioned way of thinking. Howard’s power right now is excellent, and as a result of having great power and hitting behind Chase Utley, Howard has high RBI totals. Howard gets a large number of chances to drive in runners because of the high-OBP Utley and good-OBP Victorino hitting ahead of him. To his credit, Howard does have a nice career line with runners in scoring position: .280/.416/.582 in more than 1,000 plate appearances with runners in scoring position. An excellent line, something I can’t explain, seeing as I don’t believe “clutch” hitting is necessarily a skill. It’s something I should acknowledge amidst all this, though. And has the Ted Williams shift robbed him of more hits than it’s given him? That’s another thing we don’t know. At least, not yet. As for the future shock this gives the team, the ripples from this deal will be felt for years. The Phillies will now have $55 million and change committed to Howard, Utley and Roy Halladay alone in 2012, with an additional $30 million-plus to the bank accounts of Placido Polanco, Victorino, Joe Blanton and Carlos Ruiz. The offseason preceding that 2012 season would also be a time for seven current Phillies – including Ryan Madson – to become free agents, and an additional five Phillies would have arbitration years to be paid. A total of $85 million and change is now on the books for seven players. Even if you’re not a subscriber to the belief that this deal is budget-hampering, it’s hard to dispute that this is money that could be spent better down the line. Twenty-five million can get a whole lot on the free agent market, or even be put toward international scouting or other players currently on the roster or any number of other things. It’s like what was discussed earlier about the going price of a “win.” Howard has averaged just below five wins over his four full seasons, yet must now be expected to be even better – as one player – than whatever combination of talent $25 million could bring in every season, and for a long stretch. His production alone must eclipse whatever value could be brought to the team in other areas of need down the line, and he just won’t be capable of that. Let me be clear, once more: I appreciate what Ryan Howard helped bring us in 2008. I find my jaw hanging a bit agape at the length of some of his home runs. I can respect his desire to get paid like a top-tier player. I just don’t believe that a player with what appear to be declining skills – skills that weren’t enough to make him a top-ten MLB player to begin with – should be paid one of the most expensive contracts in history for a time period where his skills are expected to decline even further. That’s not slighting Howard as a person, but rather putting Howard the baseball player into perspective. He has power, and, if you wish to call it a skill, hits well with runners in scoring position. That’s it, at least in terms of major credentials in favor of Howard getting such a monstrous deal. My belief that Howard is overpaid is not a reflection of the intangible contributions he has made to this city nor his personality; those are things I cannot measure and am neither counting for nor against his case. I just judge based on the earlier-stated belief that MLB contracts are about expected production, not the past. To that end, in the long view, Howard’s contract is set up to become an albatross. He will be all but untradeable – the no-trade clause is redundant, given the enormity of his yearly salaries – and his budget hit could restrict the Phillies’ movements in the free agent market for quite a while, assuming their current economic state doesn’t change. Future circumstances could provide the team with their own cable network, something that would surely soften the budget blow of Howard’s deal, at least, but no such thing appears imminent. As it stands right now, the Phillies have given a top-player contract to a player whose skills have begun to decline while playing at a non-premium defensive position at which he is not among the five best in the Majors. Again, I like having Ryan on the team. I will cheer him on when he does well and boo him when he slumps, just as I would any other player not named Utley. I take exception to his contract and the precedent it could set for this team’s future deals, as well as the potential restrictions it could have on the team’s roster construction. It’s a gross overpayment and misjudgment of ability as it stands right now. Only time will tell if I – and the history I’ve used as anecdotal evidence – will be persuaded away from our beliefs. Hey, things could change. I’m certainly open to persuasion. And maybe the front office could pull out a rabbit and re-sign Jayson Werth after all. Who knows? All I know is what I know on this day, and that’s what I’m going with. I’m sure others are far more content with this deal than I am, and they are even quite pleased at the news. More power to them, for sure. There’s little doubt that Monday was a momentous day, further ushering in a new era of highly competitive, heavily funded Phillies baseball. I’m just not feeling this particular deal. At least not yet.